This is a rustic, intimate trip that will take you into the past of California where you will experience rugged and wild beauty. We visit Gold Rush towns, experience Native American ceremony (that is still practiced today) and visit towering redwoods and beautiful beaches. Take time in nature for reflection and spiritual practices to heal ourselves and the earth. Arrive at San Francisco International Airport and transport to hotel near Golden Gate Park and settle in to hotel. Option for those arriving early: Meet at noon in the hotel lobby and take some time to visit the city. You may want to explore the park or Haight-Ashbury area or visit the Japanese Tea Garden in the park. 5:00 pm – Meet the group, introductions and Gratitude Circle. Dinner with the group. Today we pack up to go to the Marin Headlands for the next two nights. But first we will spend our day in San Francisco’s North Beach. We start with a visit to the National Shrine of Saint Francis on this, his Feast Day. Saint Francis is the patron saint of animals and namesake of San Francisco. He can help us connect to the natural world. This is a sacred site, deemed holy space by the Pope. It is a smaller replica of the Potzincula in Assisi, Italy, the first church that was restored by Saint Francis. It is made of stone quarried and brought over from Assisi. We will take our time to connect, pray and meditate. Exiting the Portzincula we find ourselves on the edge of China Town. We’ll stroll through the shops and eat lunch at one of the local restaurants. We conclude our sacred sites of San Franciso at Grace Cathedral and walk the labyrinth. This labyrinth (one outside and one inside) is a replica of the one at Chartres Cathedral in France. Walking the labyrinth we travel inwards, towards our center. There we receive the richness of our sacred self and take it back out into the world. Grace Cathedral was where the first United Nations meeting was held and is long-known as a place where people come together in a shared vision of peace. Let this be a time to set your own sacred intention for this journey. We will then head north, crossing the Golden Gate Bridge to the Marin Headlands for a simple meal of hot soup and homemade bread. Those who wish may participate in a guided night walk. Today is a day to relax and enjoy the natural beauty of this state park. We start our day with a walk to the beach and visit the Headlands museum. An evening of sharing our spiritual practices follows dinner. In the morning we pack up and drive to the sacred Mount Tamalpais. With 360 degree views of San Francisco and the Pacific Ocean, choose to climb to the lookout tower or walk a level path encircling the top of the mountain. We will enjoy a picnic before driving on to Nevada City, Heart of the Gold Country! We arrive early evening and settle into our lodging where we will be staying the next 6 nights. A short walk to downtown for dinner at a local brewery will rejuvenate us for the next round of adventures. We will leave Saturday morning at 6:30 to arrive for the sacred Sunrise Ceremony with the local Maidu Tribe. Over the weekend we will attend the ceremonies and celebrations of Indigenous People’s Day including Calling Back the Salmon to our Wild and Scenic Yuba River. Sunday will be full of stories of the ancestors, performances, native music, drumming and more. Both days a typical potluck meal will be shared along with the Salmon Feast on Saturday. Today we will visit the Empire Mine and walk the Cosmic Clock of Grass Valley. We will take a tour of town with the awareness of these cosmic energies and how they have affected the layout of buildings such as the churches, the banks, the hotels and more. “Starlight Compost” will guide us through a day of living in nature. We will learn how she makes fire without matches, weaves cattail sun hats and uses ancient earth based crafts and skills. Feast on native foods and participate in a sweat lodge ceremony. We visit Pata Panaka the site of a local Maidu Indian village. This is a part of the Burton Homestead that was granted back to the native people that were once indigenous to this land. The land is sacred to the people. This is a place where they have restored ruins of the pit houses, which look like tipis but are made of cedar bark. We will partake in storytelling and touch the earth in a meditative walking tour. In the early evening, we will walk the Cosmic Clock of Nevada City and enjoy traditional Mexican food at a local restaurant. Today we pack up and drive to Big Basin where we will stay in cabins for the next few nights. At Big Basin we can walk through magnificent California Redwoods, reaching heights of almost 100 meters. You will feel the energy of the forest, maybe even connect with the elemental beings and fairies here. On our way, we will stop and visit the Mission San Jose. This historic building shows the lifestyle of the early settlers of this area. Arriving in Boulder Creek, we will stop at a local coffee roaster for refreshment before heading to the campgrounds in Big Basin. Today is a day to take in nature and experience the Redwoods. 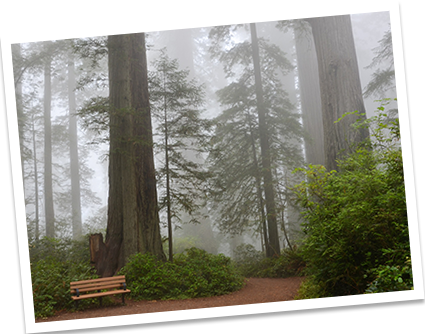 Explore the many paths that meander through these ancient redwood groves and meditate with the forest. Campfire cookout at the tent cabins in the evening. Storytelling around the campfire in the evening. We participate in a Red Cedar Circle where Johnny Moses will share stories of his people. Johnny Moses is the great-great grandson of Chief Seattle. This SiSiWiss (Sacred Breath) Medicine Circle includes drumming, singing and prayers as well as a feast, typical American potluck style. We will visit Santa Cruz harbor. Later we walk along the cliffs to Natural Bridges State Park and enjoy the beauty and power of the ocean waves. We will visit beaches and tide pools on our drive back up Hwy 1 to Half Moon Bay. That evening we will stay at lodging near the airport. Farewell dinner and wrap up of our experience with a final Gratitude Circle together. In the morning, breakfast together and then ride the shuttle bus back to the airport to fly home.